Continuing our catecheses on the Church, today I would like to look at Mary as image and model of the Church. I do so taking up an expression of Vatican Council II. The Constitution Lumen Gentium states: “As St Ambrose already taught, the Mother of God is figure of the Church in the order of faith, of charity and of perfect union with Christ” (n 63). 1. We begin with the first aspect, Mary as model of faith. In what sense does Mary represent a model for the faith of the Church? Let us think who the Virgin Mary was: a Jewish girl, who with her whole heart was awaiting the redemption of her people. But in the heart of this young daughter of Israel there was a secret which she herself did not yet know: in God’s design of love she was destined to become the Mother of the Redeemer. At the Annunciation, the Messenger of God calls her “full of grace” and reveals to her this plan. Mary responds “yes” and from that moment Mary’s faith receives a new light: it is concentrated on Jesus, the Son of God who took flesh from her and in whom the promises of the whole of salvation history are accomplished. Mary’s faith is the accomplishment of Israel’s faith, precisely in her is concentrated the whole pathway, the whole road of this people who awaited the redemption, and in this sense she is the model of the Church’s faith, which has as her centre Christ, the incarnation of the infinite love of God. How did Mary live this faith? She lived it out in the simplicity of the thousand daily tasks and concerns of every mother, such as providing food, clothing, care of the home…. 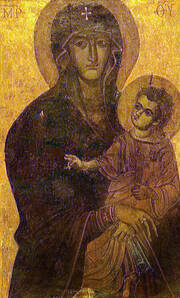 It was precisely this normal existence of Our Lady that was the terrain in which a unique relationship and a profound dialogue unfolded between her and God, between her and her Son. Mary's "yes", already perfect at the start/beginning, grew all the way to the hour of the Cross. There her motherhood spread embracing each one of us, our lives, so as to guide us to her Son. Mary lived always immersed in the mystery of God-made-man, as his first and perfect disciple, pondering everything in her heart in the light of the Holy Spirit, so as to understand and put into practice the whole will of God. We can/Let us ask ourselves: do we let ourselves be illuminated by the faith of Mary, who is our Mother? Or do we think her distant, too different from us? In moments of difficulty, of trial, of darkness, do we look to her as a model of trust in God, who wants always and only our good? Let us think about this, perhaps it will do us good to rediscover Mary as model and figure of the Church in this faith that she had! 2. We come to the second aspect: Mary model of charity. In what way for the Church is Mary a living example of love? We think of her availability in relation to her cousin Elizabeth. Visiting her, the Virgin Mary not only brought her material help, this too, but she brought Jesus, who was already living in her womb. To bring Jesus into that home meant to bring joy, the fullness of joy. Elizabeth and Zaccariah were happy about the pregnancy that had seemed impossible at their age, but it was the young Mary who brought them the fullness of joy, that which comes from Jesus and the Holy Spirit, and is expressed by charity freely given, by sharing, by helping others, by understanding them. Our Lady wants to bring also to us, to us all, the great gift which is Jesus; and with Him she brings us his love, his peace, his joy. In this, the Church is like Mary: the Church is not a shop, is not a humanitarian agency, the Church is not an NGO, the Church is sent to bring to everyone Christ and his Gospel, this is the Church; she does not bring herself — whether small or great, whether strong or weak, the Church brings Jesus and must be like Mary when she went to visit Elizabeth. What did Mary bring to her? Jesus. The Church brings Jesus: this is the centre of the Church, to bring Jesus! If hypothetically, it were to happen that the Church were not to bring Jesus, this would be a dead Church. Understand. She must bring Jesus, and she must bring the charity of Jesus, the love of Jesus, the charity of Jesus. We have spoken about Mary, about Jesus. And us? We who are the Church? What is the love that we bring to others? Is it the love of Jesus, who shares, who forgives, who accompanies, or is it a watered-down love, like wine so diluted that it seems like water? Is it a strong love, or a love so weak that it follows the sympathies, that it seeks a return, a self-interested love? Another question: does this self-interested love please Jesus? No, it does not please him, because love must be freely given, like his love is. What are the relationships like in our parishes, in our communities? Do we treat each other as brothers and sisters? Or do we judge each other, do we speak badly about one other, do we each care for our own "backyard", or do we care for one another? These are the questions of charity! 3. And briefly one last aspect: Mary model of union with Christ. The life of the Holy Virgin was the life of a woman of her people: Mary prayed, Mary worked, went to the synagogue... But every action was always accomplished in perfect union with Jesus. This union reaches its culmination on Calvary: here Mary is united to the Son in the martyrdom of the heart and in the offering of the life to the Father for the salvation of humanity. Our Lady made her own the pain of the Son and accepted with Him the will of the Father, in this obedience that bears fruit, that gives true victory over evil and over death. This reality which Mary teaches us is very beautiful: to be always united to Jesus. We can ask ourselves: do we remember Jesus only when something goes wrong and when we are in need, or is ours a constant relationship, a deep friendship, even when it means following him on the way of the Cross? Let us ask the Lord to grant us his grace, his strength, so that in our lives and in the life of every ecclesial community may be reflected the model of Mary, Mother of the Church. So be it!" "Je salue cordialement les pèlerins francophones, particulièrement le pèlerinage du diocèse d’Angoulême, avec son Evêque Mgr Dagens, ainsi que les paroisses et les jeunes venus de France, de Suisse et de Belgique. Frères et sœurs, comme Marie, soyons toujours unis à Jésus, dans les joies comme dans les peines, et ayons à cœur de communiquer son amour et sa joie tout autour de nous. Bon pèlerinage. I greet all the English-speaking pilgrims present at today’s Audience, including those from England, Ireland, Denmark, Norway, the Netherlands, India, Japan, the Philippines, Thailand, Guam, Canada and the United States. In a particular way I welcome the United Kingdom’s All-Party Parliamentary Group on the Holy See, with cordial good wishes for their meetings in these days. Upon all of you, and your families, I invoke God’s blessings of joy and peace! Saludo a los peregrinos de lengua española, en particular a los grupos provenientes de España, Argentina, Costa Rica, México, Panamá, Venezuela, Paraguay, Chile y los demás países latinoamericanos. Invito a todos a pedir al Señor su gracia, de modo que amemos cada vez más a María, Madre de la Iglesia. Gracias. Amados peregrinos de língua portuguesa, dirijo uma cordial saudação a todos, particularmente aos grupos brasileiros de Belo Horizonte, Braço do Norte e Jundiaí. Este mês de Outubro encoraja-nos a perseverar na reza diária do terço, possivelmente em família, para que se reflicta também na Igreja doméstica o modelo de Maria. O segredo da sua paz e confiança estava nesta certeza: «A Deus, nada é impossível». Desça, pois, sobre vós e vossas famílias a Bênção do Senhor. أتوجَّه ُ بتحيةٍ حارة إلى الحجّاج الناطقينَ باللغةِ العربية، لا سيما القادمين من الشّرق الأوسط. "إن أمَّ اللهِ – حَسَبَ تعليمِ القديسِ أمبروسيوس – هي صورةُ الكنيسةِ في الإيمانِ، والمحبةِ، والإتّحادِ الكامل بالمسيح". أَستودِعُكم جميعاً شفاعةَ مريمَ الأُموميّة، أنتم المتدّينون لها بشكل خاص، وأمنحكم جميعاً البركة الرسولية! Pozdrawiam serdecznie Polaków. Rozważane dzisiaj codzienne życie Maryi, Matki Bożej, to szczególna modlitwa, ustawiczny dialog z Bogiem Ojcem i Jezusem, Jej Synem. Trwajmy z Nią na modlitwie. Zawierzmy wszystko Jej Niepokalanemu Sercu. Upraszajmy, szczególnie teraz w październiku, w modlitwie różańcowej, pokój dla świata i powrót do ewangelicznych wartości. Z serca błogosławię wam tu obecnym i waszym bliskim. Rivolgo un cordiale benvenuto ai pellegrini di lingua italiana. Saluto i fedeli delle Diocesi di Alife-Caiazzo, Cassano allo Ionio, Frosinone, Grosseto, Sant’Angelo dei Lombardi-Conza-Nusco-Bisaccia e Tursi-Lagonegro con i rispettivi Vescovi, venuti alla Sede di Pietro in occasione dell’Anno della fede. Saluto i religiosi, in particolare i Padri Scolopi, nel quarto centenario della fondazione dell’Ordine, ad opera di San Giuseppe Calasanzio, a favore dell’infanzia e della gioventù; le numerose associazioni, particolarmente quelle impegnate nel volontariato e nella solidarietà con i bisognosi; le forze dell’ordine e i gruppi parrocchiali. Invito tutti a rivolgersi sempre alla Vergine Maria con la preghiera del Rosario, per rinnovare la nostra fede in Cristo e sentirci intimamente uniti alla sua Chiesa! Lastly, an affectionate thought goes to young people, the sick and newlyweds. The month of October reminds us of each person’s part in the mission to proclaim the Gospel. Dear young people, especially seminarians of Verona and young people from the Diocese of Manfredonia-Vieste-San Giovanni Rotondo, may you be courageous witnesses of the Christian faith: dear sick people, offer your daily cross for the conversion of those far from the Gospel; and you, dear newlyweds, announce the love of Christ beginning with your families."